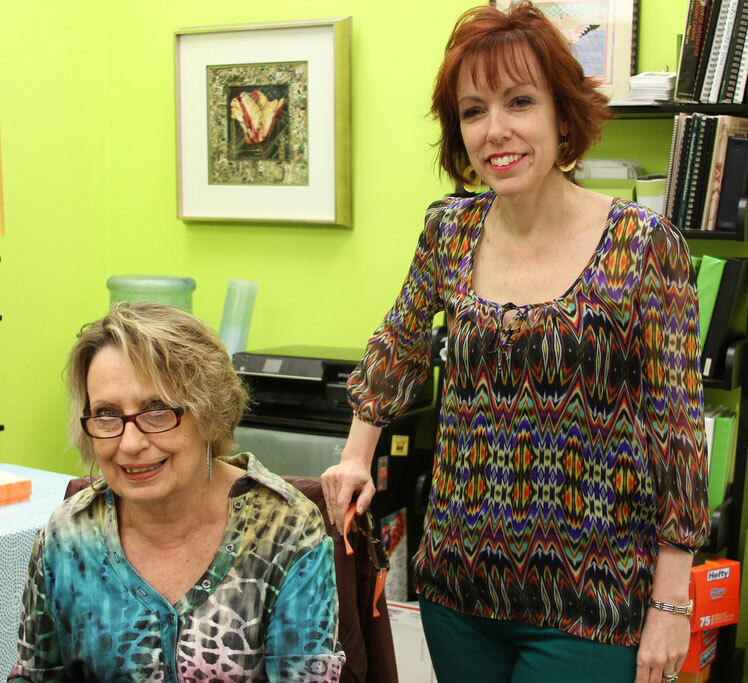 April 26 – 28th was a Brenda Hart weekend at Bedecked and Beadazzled. Brenda comes several times a year and inspires us to new levels of creativity. We work in round robin style a thread and a stitch for each student and then around again. There are no more than 8 students per day so there is individual attention. One of the best things is seeing what others are stitching while you are working on your canvas. Here we are getting ready for class one day. 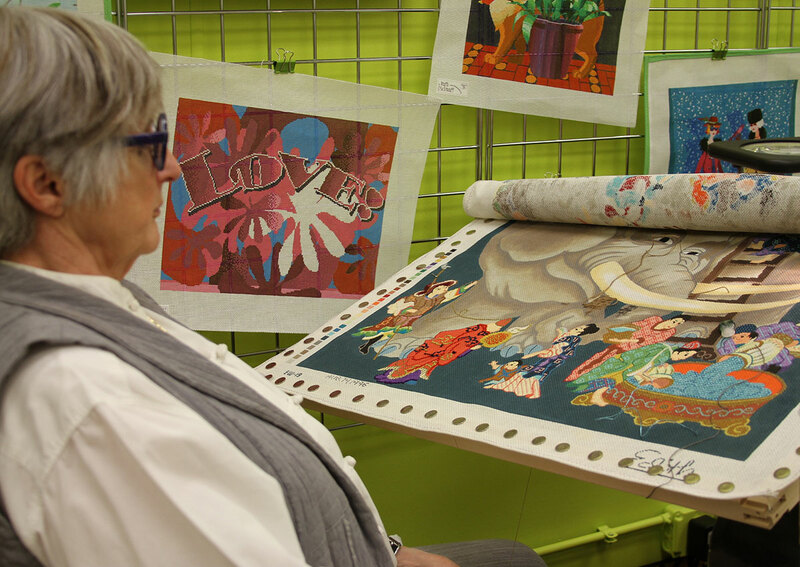 Each student brings a canvas of their choice for Brenda to select threads and stitches. Palma started this fabulous John Johanson heart from Melissa Shirley. Ribbons for the sunflowers and French Knots for the tiny blue flowers are just some of the fun details. Linda is having size issues lately. Every canvas she selects is huge!!! She started the Mother Goose canvas last month with Meredith Willet. These projects should keep her busy. 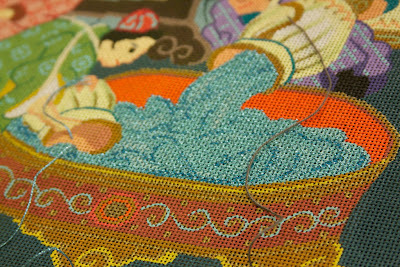 She finished the water in the bathtub very quickly thanks to T Stitch worked in Kreinik Braid. You know we all love Zecca canvases so there is usually one in each class. My mom started this one. Each circle will be different. 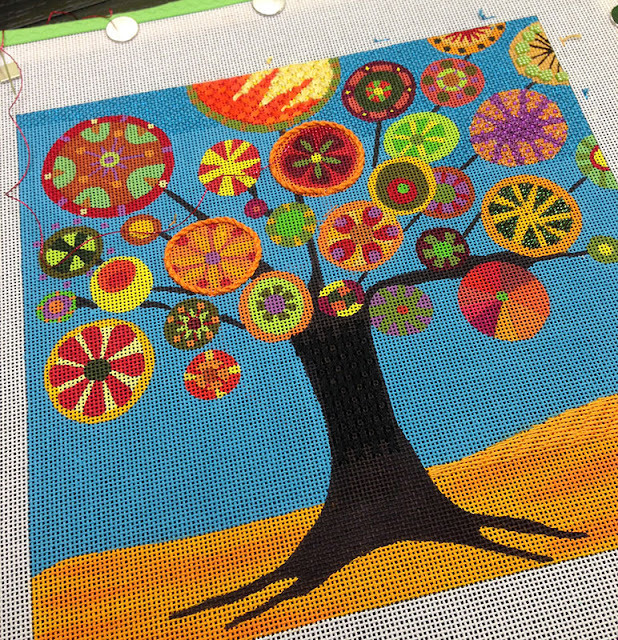 So far the background, tree trunk and grass are worked out along with some of the circles. We even have oh-so-cool Zecca buttons to add just the right touch. 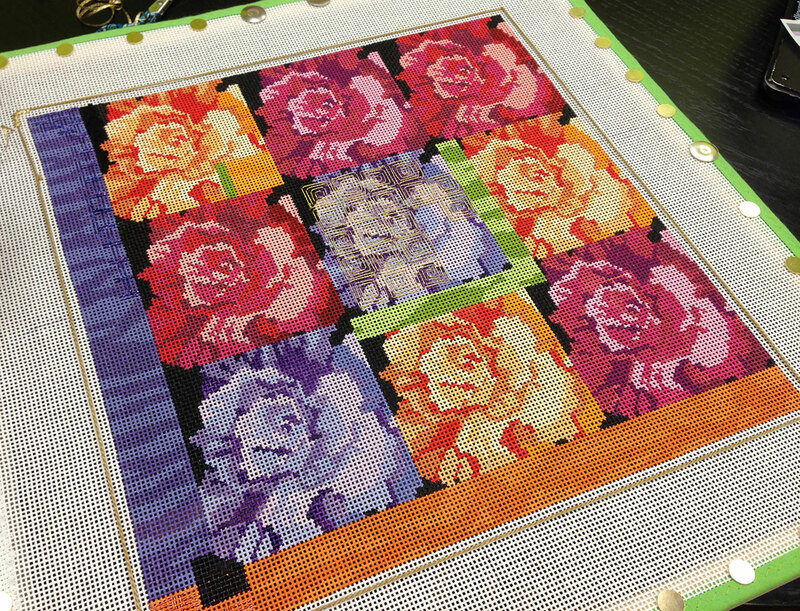 Debbie started one of my classic canvases – the Rose Squares. Brenda suggested an all over pattern of gold squares stitched in a fine metallic to enhance the roses and keep the color changes from being overwhelming. Maggie canvases are another shop favorite. 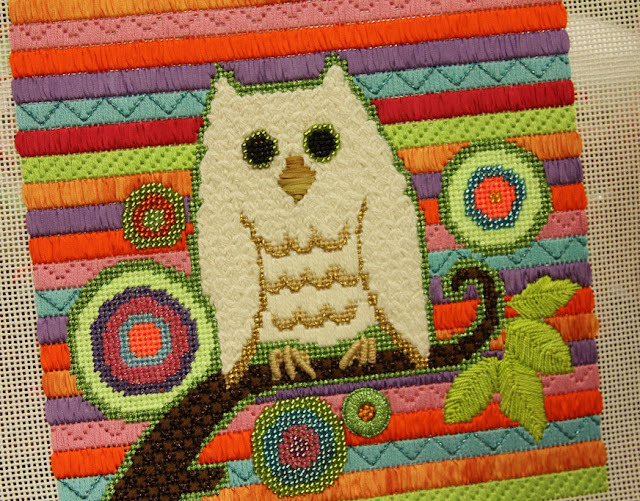 Pat is working on this sweet pair of owls. Love the wings and the tree and the background and the flower. How simple and simply perfect is that flower? Lazy Daisy Stitches with a single row of beads in the center of each stitch. Thank you Brenda. Great idea! Here’s another Zecca canvas. Kathy got a lot done on this one. My favorite part is this leaf. It’s all random! Three different random stitches complete with color changes on each part of the leaf. 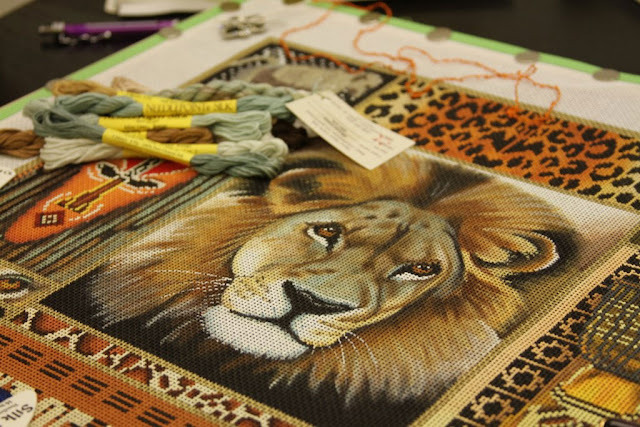 Sue is working on a new Lani canvas, out of Africa. The mask panel on the left is amazing. Great threads and stitches. Beads are next! And what did I do this weekend? I sit not so still and not so quietly ready to answer questions and help if I can. I was optimistic that I would finish Bastet over the weekend. That my friends was a pipe dream. I think I did about 12 stitches. Palma started the Alice in Wonderland canvas last time with Brenda and wowza she got a lot done. I love when people bring finishes to show off. Check out the tiny crown on the Queen of Hearts’ head. Katie started this owl about a year or so ago with Brenda and finished it this weekend. She was determined she was leaving it in my hands for finishing. I have such fun ideas for how we are going to finish it. I’ll post a picture when it comes back from the finishing elves. 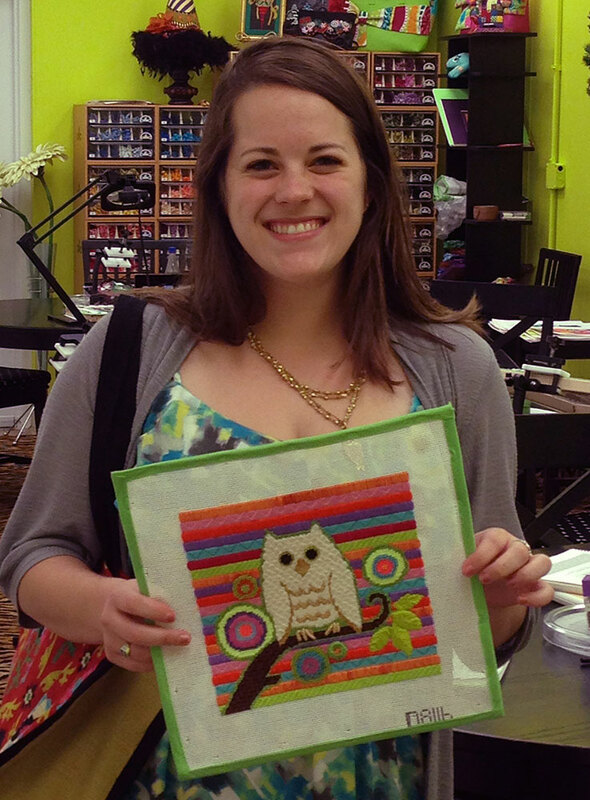 In the midst of all this creativity we had a special visit from a dear friend Sheena of Sheena’s Sweet Stitches. 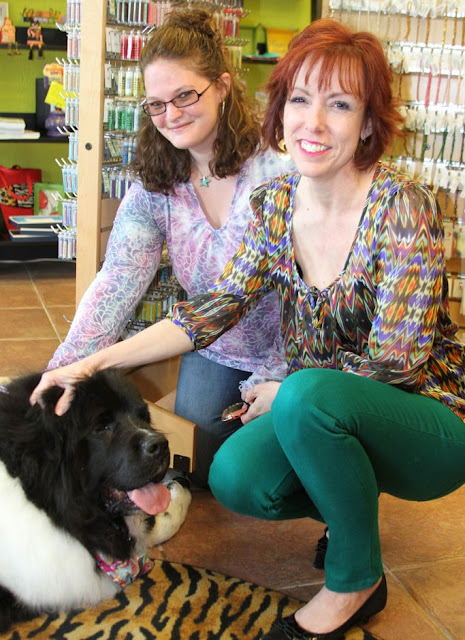 She is headed north on a new adventure and had to stop in for hugs and stitching supplies! She even brought Angus so that Emily and I could give him a hug! Safe travels my friend. All in all it was a great weekend. I miss you all already. There’s no time to waste. 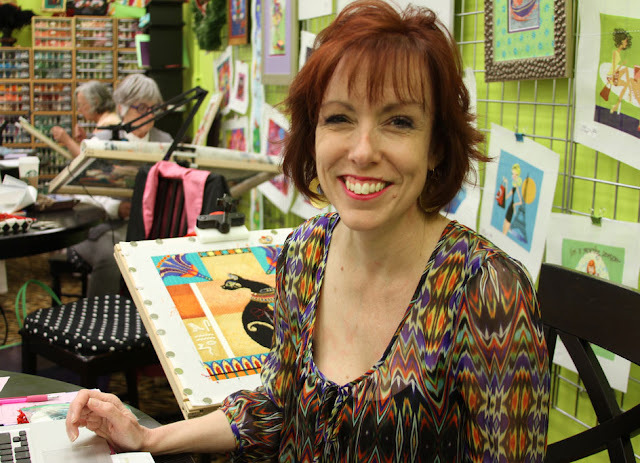 in 3 short weeks Julia Snyder will be here inspiring us with more stitches and creativity. The more we do the more we want to do. Once again…looks like a good time was had by all, including Angus! Miss you Ruthie!